yilianna is using Smore newsletters to spread the word online. Should Cheerleading Really be Considered a Sport? You may think that cheerleading is just all about waving pom-poms around and screaming for your team. 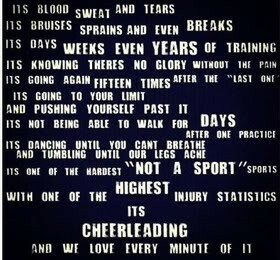 Little do you know cheerleading is a sport, not only is this coming from a cheerleader but there are many reasons why. Cheerlading should be consisders a sport because the there is a lot of physical strength, creativy and a lot of gymnastic skills. Most people don't know what it takes to have to throw a girl in the air and catch her.They think that its as easy as 1..2..3, but in reality it isn't. It takes a lot of practice and upper body strength to do this. You need to get used to your flyer so that it will be easier for you to catch her since your used too her weight. There is times where she'll come down and hit you so hard but you have to be able to catch her and use all your physicla strength if not everyone in the stunt group would get hurt. Physical strength isn't just required in stunts its a big part of everything CHEER and people don't tend to realize that. Another major part in cheerleading is all the creativity that it takes to come up with a routine. Kind of like in football where they have to make plays in order to win the game.Well same thing in cheer you have to come up with routines that have stunts,dance and tumbling. Creativity is used alot throughout cheer, every team wants to have the best routine so your creativity of stunts and dance comes in handy to create an amazing routine. Cheerleading consists of a lot of gymnastic skills. Tumbling being one of them. A cheerleading routine is not complete with out a tumbling pass. In order to tumble a lot of strength is involved here too. Girls work extra hard and practice so much to get a tumbling pass down. Cheerleaders bruise their ankles and sprain there knees while throwing there tumbling. Flexibilty is another gymnastic skill that is a big part in cheerleading. In order to get your jumps high you need to stretch and stretch alot and that will help your jumps get higher while also helping your flexibility. In many cheerleaders eyes they would love to see cheerleading officially become a sport. In every cheerleaders heart they know that cheerleading is a sport, but it'd be nice if everyone else saw it too and not just had this one image of a cheerleader. Cheerleader work just as hard as athletes maybe even harder but people don't seem to realize that. Over all cheerleading should be considered a sport because of the physical strength that takes place just like in every other sport, the amazing creativity it takes to create incredible routines and outstanding gymnastic skills cheerleaders have. 1992, Aoakes. "Cheerstarworld." Cheerstarworld. Cheerstarworld, 30 Apr. 2013. Web. 13 Feb. 2014. Quinn, Colleen. "Is Cheerleading a Sport? A Massachusetts Bill May Make It One." Sun (Lowell, Massachusetts): N.p. Jun 20 2013. SIRS Issues Researcher. Web. 10 Feb. 2014 .